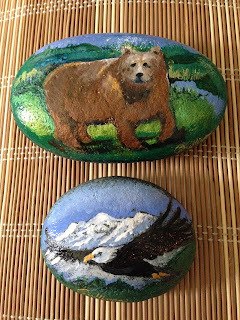 This weeks rock(s) are a few custom rocks that I did for someone who came by to visit Calistoga a two weeks ago. The weekend was wet again on Saturday, but you won't hear any complaints around here.The water is needed and hopefully by the end of this month we will have enough to get us through the summer season. Being the driest year on record has worried a lot of vintners because as you might guess, no water... no wine! I am inside today painting some rocks that I hope will be more, better or at least different from those I've done in the past. Although figurative images like the ones below are not my forte´ They are a departure from what I've done of late.The bear was said to look a bit "tubular" and I have altered it a little after a friend criticized it. The eagle was not as difficult to paint as I thought it would be. 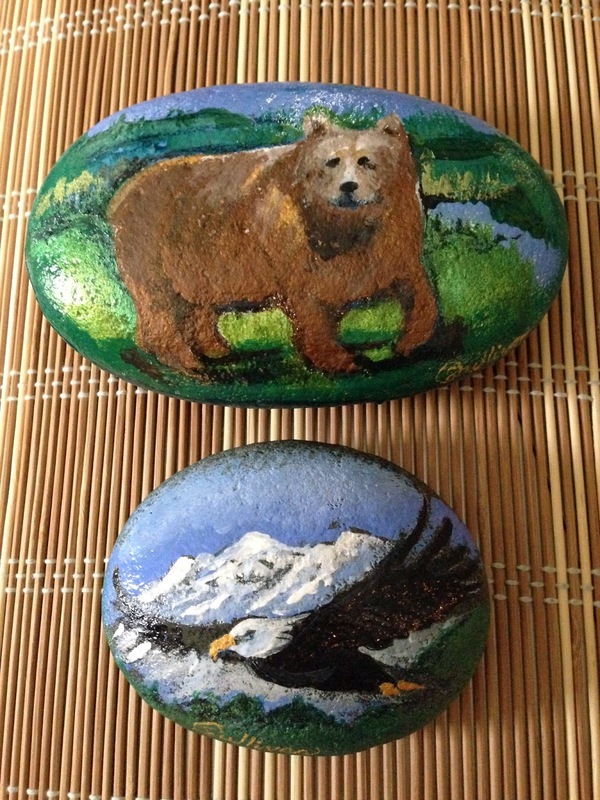 It has been almost four years since I've been providing these gift rocks for people like yourself.I was not clear about what it was that I wanted to do when I first started painting them.Initially, It was about finding a new medium with which to express artistic abilities. Then it became a spiritual journey. I would go out to the ocean and collect only those rocks which felt good in my hand and had a flat smooth surface on which to paint. 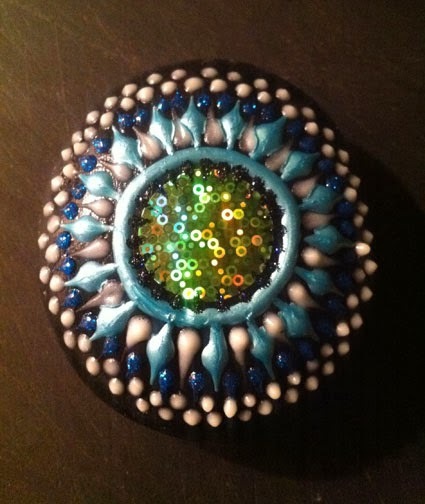 I figured that they would be best suited as "Meditation Objects" that people would use to focus their attention while meditating.I gave a few of these to friends along with a sheet of affirmations.More and more ideas came to me in the succeeding months. Three years ago,I approached a woman from my church who ran the Calistoga Farmer's Market.She began renting me a vendors space so that I could begin to SELL these pretty rocks.Sometimes, I entertain the idea of being supported on a "Suggested Donation" basis, but I am afraid that I would be overwhelmed with work,and would go broke fast. 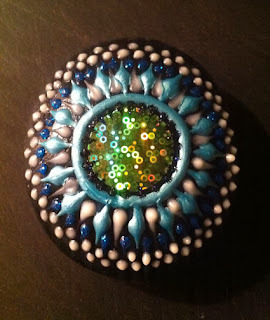 I recall seeing a ceramicist last year who had a booth outside a "Further" concert who seemed to be doing fairly well by providing a current generation of Dead Heads with pendants heralding expressions of "Peace" in different languages.These he had fired out of clay and was accepting donations only.I have no idea if he is still making a living this way,but his sentiment and cause were admirable.I however,need a steady income and the confidence that provides. Well wouldn't you know, these rocks have begun to sell! I've learned what is a fair asking price for a desired result.Even when custom work is requested,I relish the creative challenge.It is a thrill a minute.Your suggestions have found their way to the market table and my enthusiasm grows. Bottle stoppers,Magnets,Pendants,Stacked Cairns, Mirrored rocks and other unique items have been produced and have sold well.Many have suggested that I sell online.Although I've resisted this idea, wanting to maintain control of my inventory...the idea has not been dismissed out of hand.I suspect that I am a bit fearful of impending success.Perhaps this fear is unfounded, but the YOUR SPIRIT ROCKS!™ business is still moving at pace comfortable for me. This blog was created to have you see the latest products and to be a part of the development of what perhaps could be a movement of sorts.You have talked to me about having workshops,and I still would like to pursue this idea.Is this something you would like? Feel free to join this blog and give me some direction.I would really like to know where to go from here. Give it away to keep it! 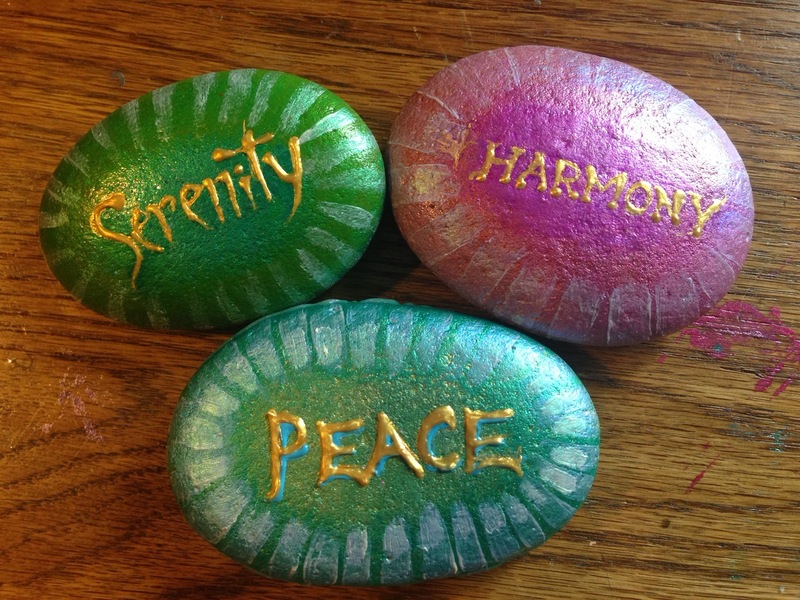 These rocks have always been a gift.The way they feel in my hand...the roundness, the weight, the smooth (or rough) texture.The rock has always been a symbol of strength and solidarity. It is my contention that your rock chooses you.Sometimes, if feels good just to skip one across the water or stack one on top of another.Rocks are like good ideas that form in the mind and take shape.Once a rock is passed on, it continues it's journey. Your rock may end up miles away from where it originated.It may be ground into sand or smaller pieces in service to to a slab of concrete or other building material.It may just end up as a paper-weight on your desk or window sill.If the rock is not meant for you, you will know it.Pass it on to someone who notices it for whatever reason. Like our children, these are products of life longing for itself.These contain an energy that can neither be created or destroyed.